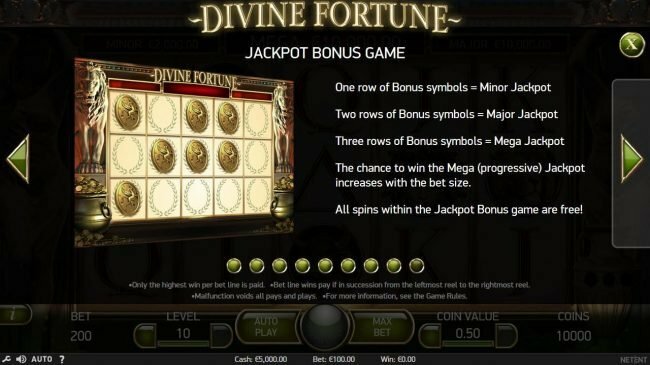 Review the Free Divine Fortune online slot machine produced by Net Entertainment developers with 20 lines and 5 slot reels. 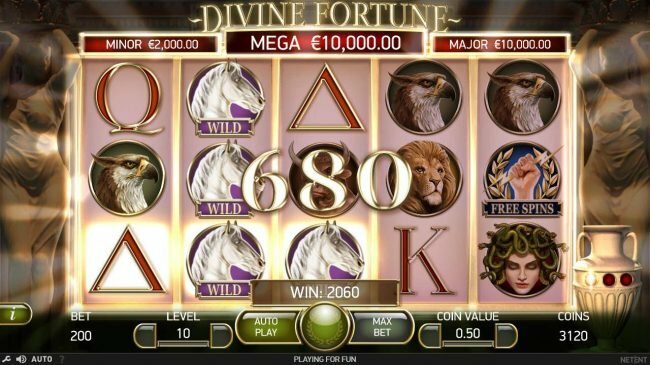 Divine Fortune Slots 5 out of 5 based on 2 ratings. 2 user reviews. 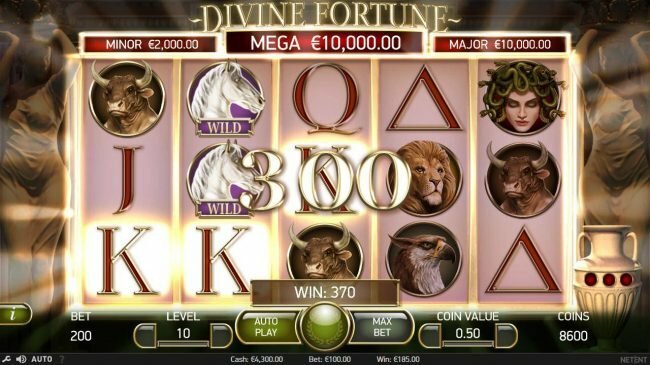 Divine Fortune slot is a cool 20 payline, 5 slot reel slot. 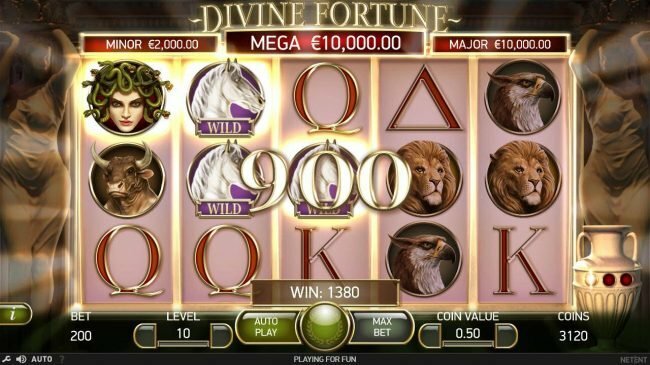 This ancient Greek mythology legend themed online video slot delivers hours of fun by displaying symbols such as Medusa, lion, Minotaur and hawk. 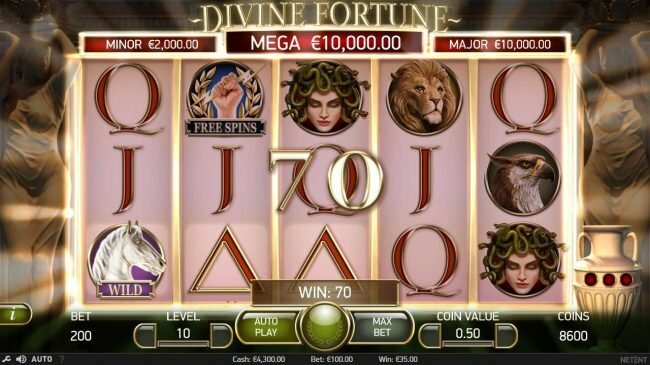 Additionally you will notice playing cards ace, king, queen and jack that add the feeling of this nicely done ancient Greek mythology legend online video Slot Machine. 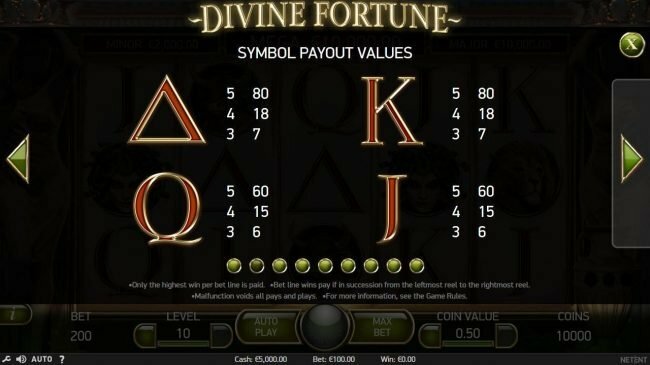 Allowing single spin coin values from $0.01 up to $200, this Net Entertainment developed video slot allows lots of levels. An insane win will have many wilds in the winning combinations. 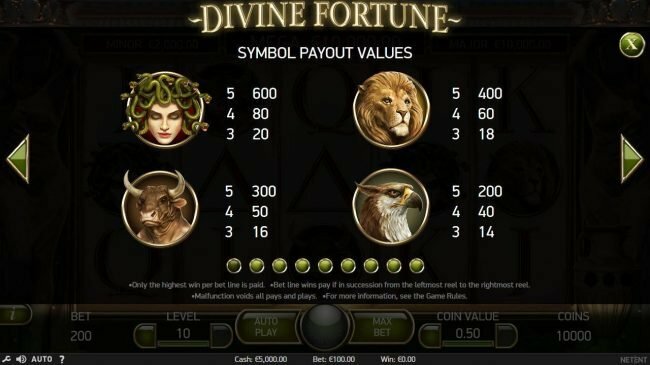 Scatter images found in Divine Fortune are not ordinary ones, these Zeus Free Spins and gold Pegasus coins do not need to appear on a single to win. 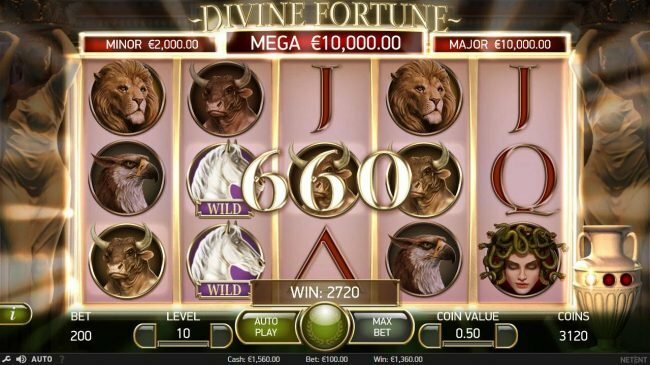 You will notice that on a lot of Slots having more than two scatters will start a slot feature game. 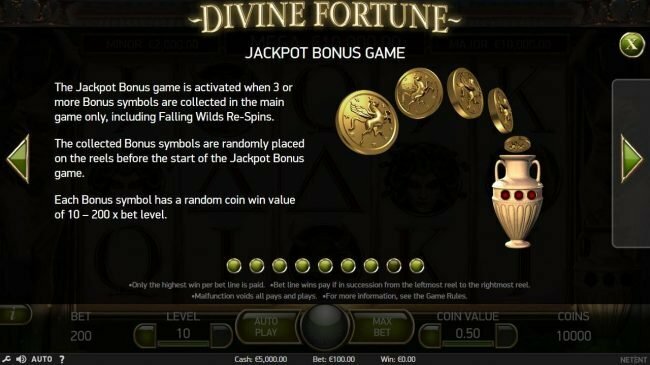 Other Online Slot Machines from Net Entertainment software such as Mystery At The MANSION, Flowers Christmas Edition and Spellcast provide the same video slot play. 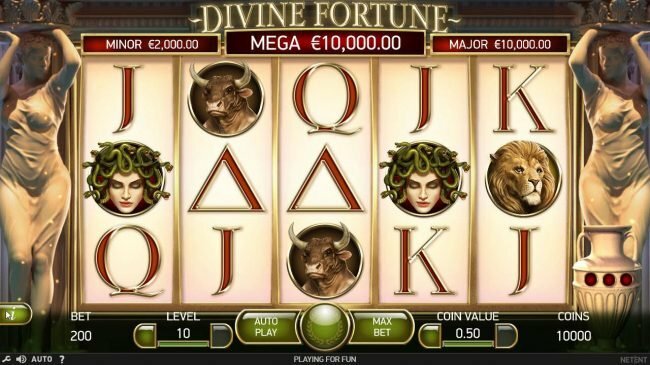 I truly enjoyed working with Divine Fortune, the ancient Greek mythology legend produced game offers some good amount of production that really puts you inside the game displaying the Medusa, lion, Minotaur and hawk art and sounds. 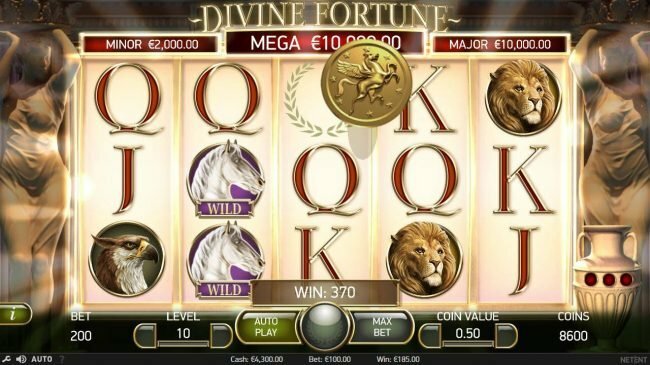 This is a slot that kept my interest for a while as I was playing it. 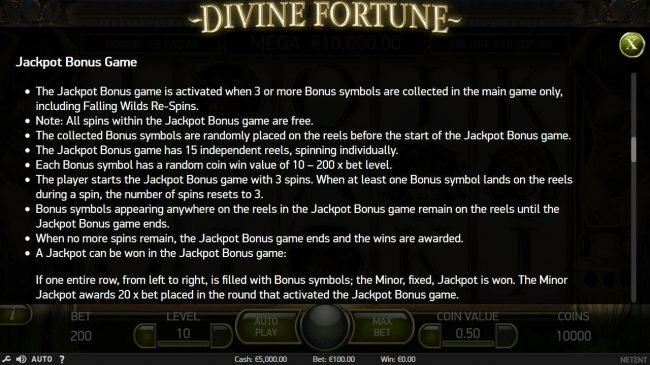 Playing Divine Fortune gives you a fun way to achieve large sums of credits, this is accomplished by getting a slot Bonus feature win. 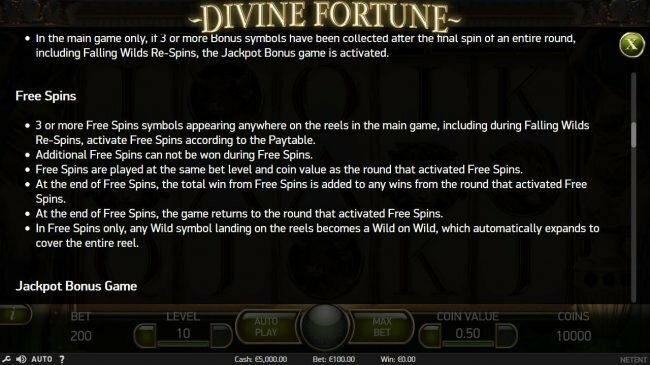 With my video Slot write ups I like to wrap up on the best items to look forward to such as these awesome game Bonuses. 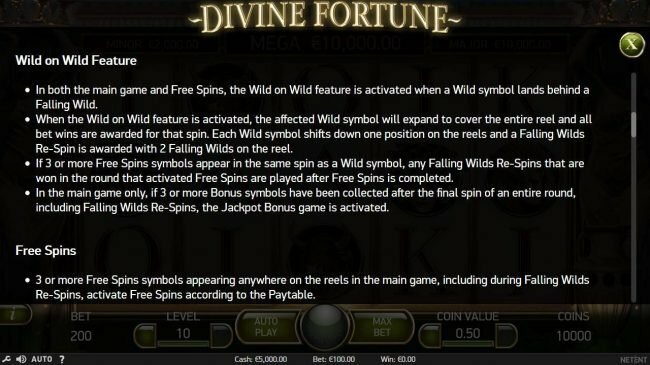 The Falling Wilds Re-Spin is started by getting Pegasus wild symbol appearing on the reels, each wild shifts down one position on the reels, this feature seems to produce extremely good. 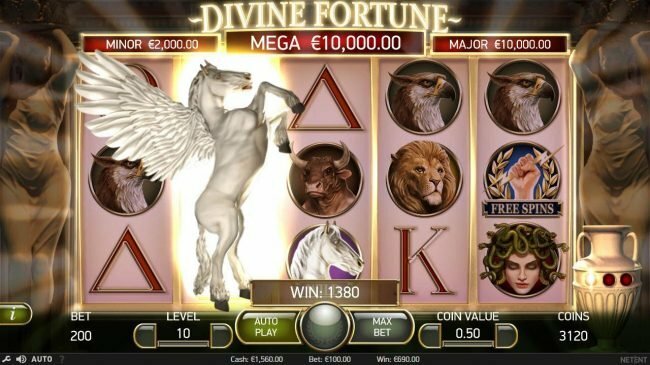 When you get landing a Pegasus wild symbol behind a falling wild the bonus round begins. 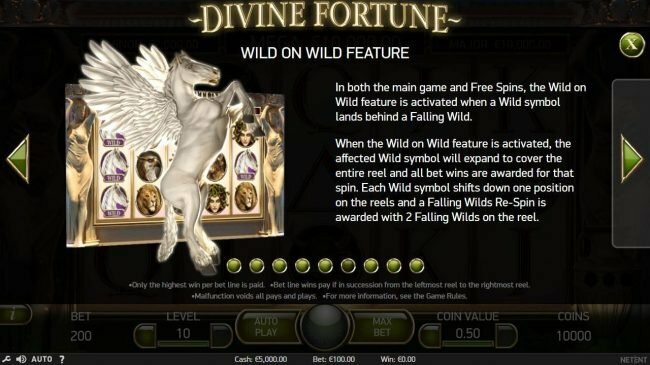 This Wild on Wild Feature offers many big rewards. 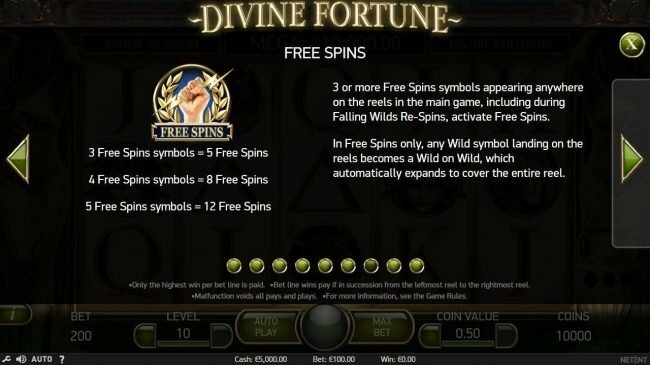 To start the Free Spins bonus Game, launched by getting three or more Zeus free spins symbol appearing anywhere on the reels in the main game awards 5, 8 or 12 free spins respectively. 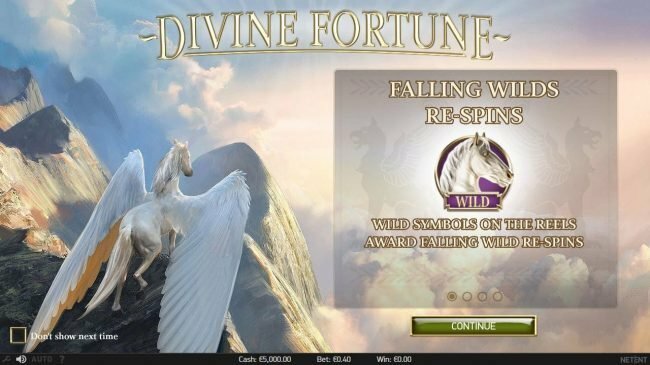 Get collecting three gold Pegasus coin during main game, including Falling Wilds Re-Spins. 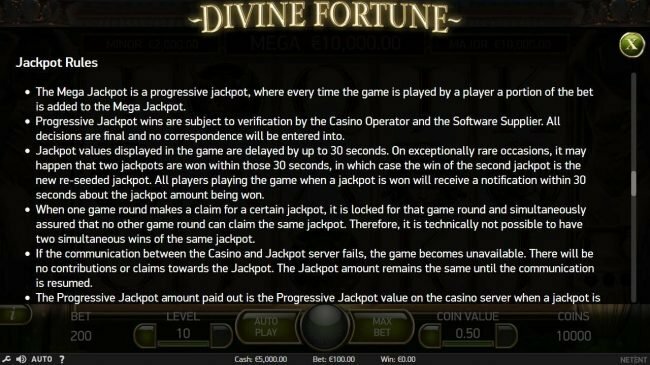 This will start the Jackpot Bonus Game bonus Game. 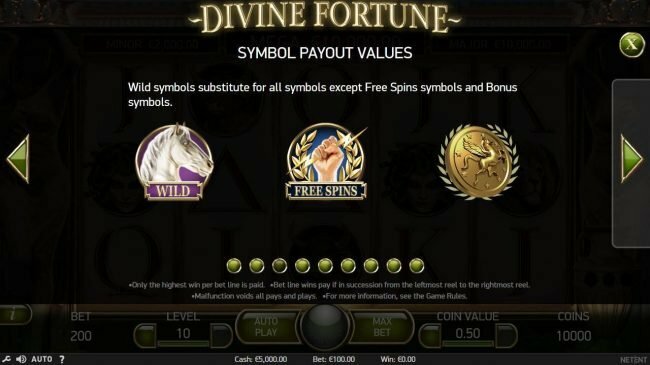 getting 1, 2 or 3 rows gold Pegasus coin bonus symbols awards the Minor, Major or Mega jackpot respectively. 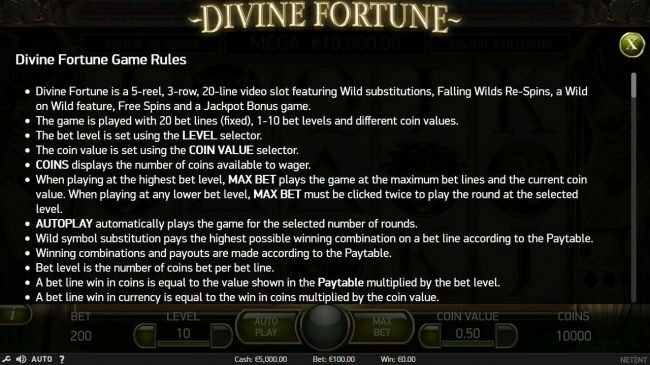 This will trigger the Progressive Jackpots feature game. 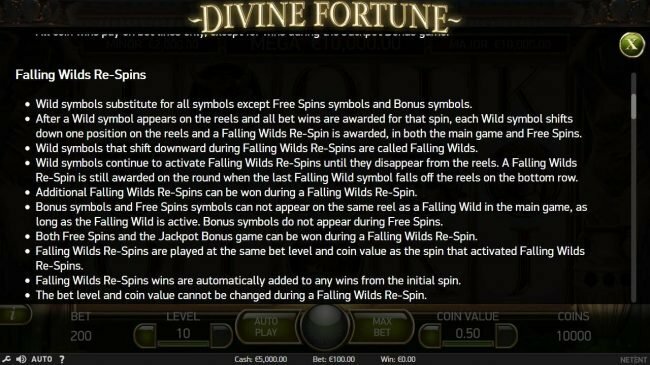 I have to grant Divine Fortune 5 out of 5 stars on the bonus rounds. you can be distracted from the actual game play. 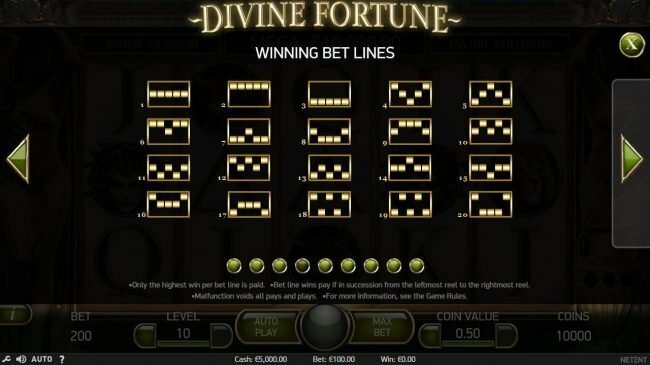 Great Fun, and excellent payouts when it gets into that mode... however it can take them away about as fast, so big wins and leave is what I should have done. I could literally play this one all day,! 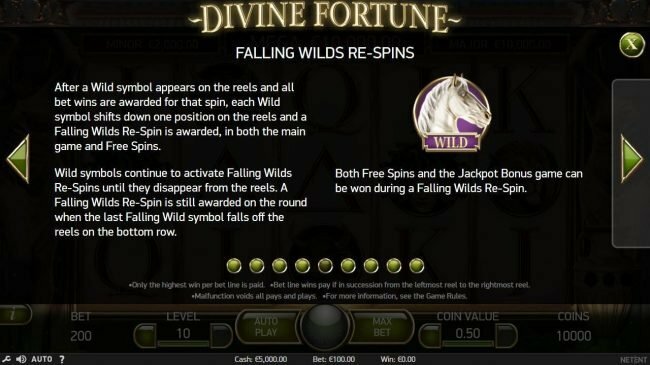 Fun, with exciting falling wilds, free spins are great.. this is one very excellent machine.